VIMTA is the No.1 choice in India and a specialist in analytical services, supporting the pharmaceutical, biopharmaceutical and animal health industry. Our analytical services support the entire life cycle from early phase drug development, to regulatory submissions and GMP manufacturing, to post marketing analytical testing requirements. We offer comprehensive routine analytical services as well as ad hoc and highly specialized testing services using modern technologies. We serve either on a fee for service or FTE service model, and can assist you in filling capability gaps and / or short term and long term capacity requirements. Our 3 decades of experience, in handling thousands of projects of wide variety and complexity, make the non-routine complex projects into routine projects for us. We have extensive experience in supporting customers with data for regulatory submissions. Our data has been well accepted by Indian, USA and several European regulatory bodies. Therefore our value addition is not only on cost and rapid turnaround time, but also in delivering high quality, knowledge based robust data and solutions for analytical challenges. We have had and continue to have, the privilege of serving many global pharma leaders, and through our partnerships have imbibed best quality practices from the world leaders. When you work with VIMTA, you are supporting a team with strong ethics and principles, a team that is dedicated to your success and the safety of the end user of your products. VIMTA’s method development and validation teams have extensive experience with developing and validating analytical methods for the determination of purity or other critical attributes of materials from development to the commercial phase of drug manufacture. Our cGMP laboratories feature a broad and diverse set of instrumentation to assist you with your analytical needs while meeting critical timelines. Drug method development and validation include chromatographic, spectroscopic, microbiology, physical characterization, “wet-chemical” and titration techniques. Methods are developed while keeping in mind customer requirements for ease of use and transfer. Validations are performed as per ICH guidelines and also for any specific regulatory requirements of your product. We offer mini validations or verifications (limited parameters such as specificity, linearity, accuracy, etc.) to support early-phase formulation and packaging development studies, in addition to full scale ICH validation (linearity, precision- repeatability and intermediate precision, accuracy, specificity, LOD, LOQ, range, robustness and stability of test solutions) for late-phase and commercial products. are an important regulatory consideration for Pharmaceutical and Biopharmaceutical companies. Each drug application (human drug or biologic) filing should contain enough information to show each proposed container closure system and safe and suitable for its intended use. The type and extent of information that should be provided in an application will depend on the dosage form and the route of administration. As per cGMP regulatory requirements (21 CFR Part 211.94 (a)), drug product containers and closures shall not be reactive, additive, or absorptive so as to alter the safety, identity, strength, quality or purity beyond the official or established requirements, and therefore drug product should be evaluated for any chemical contaminants or impurities that maybe generated during manufacturing or storage. This evaluation is performed by extractable and leachables studies. Extractables are any chemical species that can be removed from a packaging component or device or manufacturing process contact material, into solvents under controlled laboratory conditions (e.g., component is cut in pieces and incubated with solvent). Leachable is an extractable that actually migrates into a drug product under storage conditions. Not all extractables are leachables and neither are all leachables correlatable to extractables. Container Closure System refers to the sum of the packaging components that together contain and protect the dosage form. This includes both primary and secondary packaging components. VIMTA can provide customized protocol driven extractables and leachables testing services to help you ensure that your product meets applicable regulations requirements and is safe for the patient. Our scientific team, with experience of over 200 E & L studies under its belt, is well versed with the science, regulations, guidances and standards related to E&L studies. Our data has been submitted to, and well accepted by, US and European regulatory authorities. ICH Q3A/B (R2) – 2006 – Impurities in New Drug Substances/Products. Effective May 1, 2016, new USP/NF requirements have been published for plastic packaging systems used for pharmaceutical products to establish the suitability of plastic packaging systems and their material of construction for therapeutic products. The new requirements affect packaging systems for pharmaceutical products that are not yet approved by the regulator for marketing. If the packaging system is currently being used with a pharmaceutical product that is on the market, it does not require testing to the new requirements. However in case of modifications, to the plastic packaging system or its material of construction, the packaging system must be re-tested as per USP 661.1 and 661.2. If the packaging system is changed in a way that does not alter its materials, then it does not need testing. Extractables / Leachables profiling and the Toxicological risk assessment of the test data. VIMTA is one of India’s largest providers of stability testing and storage services. Multinational corporations in OTC, Rx, and Animal Health around the world trust VIMTA’s services. More than 80% of our capacities are utilized by companies located in Americas and Europe. We offer substantial cost-savings compared to investing in your own storage chambers, related space, manpower and testing equipment thereby freeing up your resources for your core activities. We conduct stability studies as per ICH guidelines and also offer customized stability programs. Our facilities fulfil all criteria of international cGMP requirements. We are WHO pre-qualified and have been successfully audited by USFDA. Thorough risk assessment has been performed while setting up the stability storage and testing infrastructure and robust systems are installed to control and manage the risks. Our state-of-the-art stability chambers, with close to ~4,50,000 Liters capacity, are equipped with advanced chiller based technologies, backup systems, redundant power backup, alarms system, and automated temp / RH excursion mobile phone notifications. All stability chambers are monitored 24 x 7 x 365 by a facility administration team through a building management system that records temperature and humidity every fifteen minutes and raises alerts as per pre-set criteria. Chambers are managed through a robust preventive maintenance program with support of in-house engineering team as well as vendor Annual Maintenance Contracts. In addition to the above conditions, we can set up stability chambers for other temperature and humidity conditions. Our Stability Testing laboratory is supported by Wide Range of Instrumentation, including manual / semi-automated / automated dissolution apparatus such as CALIPER Multi Dose G3, Tablet Processing Work station (TPW) for uniformity testing. Comprehensive testing capabilities include assay, dissolution, Karl Fischer, hardness, disintegration, friability and characterization of impurities and degradants. We offer customer specific contract labs in FTE model or fee for service model for both large scale and small scale stability testing requirements. In vitro dissolution testing may be a useful tool to forecast the In Vivo performance of drug products and potentially reduce the number of bioavailability / bioequivalence (BA/BE) studies required. For drug products that have low systemic absorption, In Vitro binding studies are considered as an acceptable alternative to BA/BE studies by regulators including USFDA. To support your R&D and regulatory filings, VIMTA offers fast turnaround physical characterization services including polymorph characterization, thermal analysis, spectroscopic analysis and particle size determination. VIMTA offers a full gamut of microbiological testing, be it batch release testing or sterility, antimicrobial efficacy or microbial contamination, endotoxin analysis, microbial identification, or method development and validation. Our purpose built cGMP compliant microbiology laboratory is fully equipped for testing of raw materials, medical devices and finished products. We have over 25 years of experience on a wide array of dosage formulations. ELISA based validation for clinical or pre-clinical sample analysis. Biological Activity and potency (in-vitro / in-vivo). BioAnalytical Services: PK/Immunogenicity for Biologics/Biosimilars. 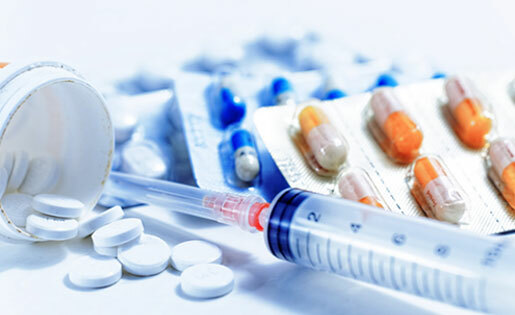 Drug products and drug substances are analysed routinely at VIMTA as per the latest pharmacopeia (USP, BP, EP, IP, JP) or customer specified procedures and specifications. All methods are used only after due verifications or validations. Our pharmaceutical testing laboratories are equipped with a full array of analytical instrumentation to perform the following tests. NBCDs or Non-Biological Complex Drugs are neither biologics nor small molecules, they are a mixture of the two. They have higher molecular weight, and are synthetic compounds that are complex in structure and can form branched structures such as polypeptides, swelling polymers, liposomes and colloidal iron carbohydrates. Some examples include Iron Sucrose, low molecular weight heparin (LMWH), Glatiramer Acetate (GA) etc. Due to their complexity and specific composition mix, these compounds cannot be fully identified, characterized, quantitated and / or described by physiochemical means to define their pharmaceutical properties. VIMTA offers US-FDA and EMEA guidance based analytical characterization as well as potency estimation (Lot Release Assay) services. Dose Analysis and Verification . It is of critical importance for pharmaceutical manufacturers to put into market compliant products. Any product defects would create losses for the manufacturer due to recalls and legal litigations, not to mention the adverse impact on the brand value. At VIMTA we help you investigate product defects so that effective solutions can be taken up to fix the root cause of the failures and prevent recurrences. Our diverse analytical knowledge and instrumentation capabilities help to investigate product defects caused by manufacturing processes. We deploy varied technologies such as SEM, FT-IR, GC / MS, LC / MS, DSC, TGA, etc., to identify the contaminants or cause of product defects. We are sensitive to your tight timeline needs and can provide express services. VIMTA offers comprehensive Pharmaceutical Grade Water testing as per USP, BP, WHO Guidelines, EU Guidelines, and US-EPA Specifications. We serve more than 90% of the USFDA and WHO approved pharmaceutical manufacturing plants located in India, to test their water for pharmaceutical manufacturing processes. VIMTA, the pioneer in India for pesticide residue testing analysis, uses state of the art instrumentation and has extensive capabilities in pesticide residues and disinfectant residues. VIMTA offers testing of contraceptives such as condoms, copper-T and pills. Along with the above tests, VIMTA also offers biocompatibility testing as per ISO 10993. Contraceptive Pills are tested as per IP 2014, and can also be tested for any other specific Standards.